Hotel owners and operators all over the U.S. are a plagued with a serious problem these days with the introduction of flat screen televisions in hotel rooms. As hoteliers are trying to make rooms more comfortable, with the comforts of home, thieves are taking advantage of the situation by literally ripping televisions off the wall to steal them. Frustrated hotel managers and owners, are trying a wide range of solutions to stop the problem. “Often times the rooms are ransacked and vandalized in addition to the asset thefts, leaving the room a mess, with thousands of dollars of repair costs to get the room back in the condition to be used by other guests” said Smith. Since the introduction of flat screen televisions, and with the price point coming down about a decade ago, hotel owners everywhere are rapidly rolling out flat screens to make hotel rooms more desirable, high-tech and comfortable. Many chains are using room upgrades as a way to be more competitive and attract more customers. In fact, Motel 6 upgraded more than 1300 properties in 2016 with flat screen televisions…that is more than 30,000 new televisions. This modernization effort is a magnet for criminals, both opportunistic thieves and organized crime. In fact, in effort to track thefts, Motel 6 executives began tracking driver’s licenses in a central database. It was discovered that thieves would visit multiple properties in a region and that numerous people were involved in string of thefts at different properties. Property managers began screening guests at check-in an effort to identify the perpetrators. D&D Security offers a proven anti-theft solution for flat screen televisions! This Super-Lok Flat Screen Security Lock Kit works with TVs on wall mounts or furniture. Includes VESA compliant screw pack, 2 steel chassis fittings, 1 four foot EX aircraft cable (superior cut resistant weight), 1 security mounting plate (furniture installation), tamper-proof (one-way) screw and 1 heavy-duty padlock. Volume discounts are available. 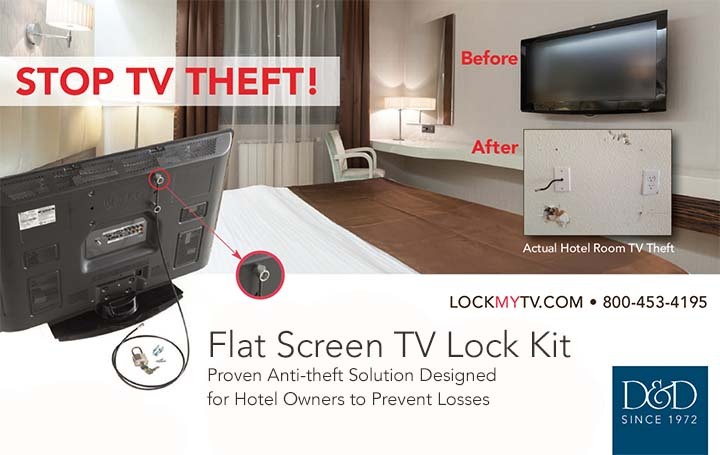 With a 100% satisfaction guarantee and lifetime warranty – this is the perfect solution to stop hotel TV theft. Call D&D at 800-453-4195 for more information or visit lockmytv.com.